Washington, D.C. – Florence Schilling was the youngest army nurse in the European theatre. 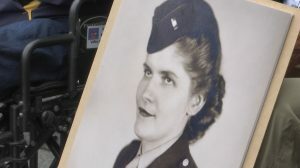 Sadly, she never made it on an Honor Flight, but the non-profit held a special ceremony at the World War II memorial in Washington, DC to honor her service. Schilling went ashore on Normandy Beach right after D-day, and served with the 138th hospital all the way to the end of the war. At the end of the war, Schilling was offered head surgical nurse at Walter Reed Army Hospital, a job she ultimately turned down to return to Southern Oregon to care for her sick mother. She went on to become head surgical nurse at Ashland Hospital. Schilling passed away earlier this year.